NEW YORK CITY, N.Y., Sept. 14, 2011 (SEND2PRESS NEWSWIRE) — EaseUS Software, a leading provider of easy-to-use storage management, data recovery, data backup and disaster recovery solutions, today announces the new update of EaseUS Partition Master, a comprehensive partition management solution with non-destructive and advanced partition manager features that go beyond the basic functionality offered by Windows’ own Disk Management tool. Resizing dynamic volume, especially resize system volume, which is limited in built-in Windows Disk Management, can be easily operated in EaseUS Partition Master now. As dynamic disks provide superiority over basic disks, it is a justification that dynamic volumes are widely used. But the disk management under Windows is limited, such as users are not able to extend the system volume when it runs out of space if there is no unallocated space behind. As a multi-functional hard disk partition management solution, EaseUS Partition Master has enhanced its ability to extend the system volume without data loss as well as other dynamic volumes, even if there is no unallocated space behind it. It also offers an easy and direct way to reorganize partitions to optimize your disk space. New EaseUS Partition Master keeps all the features of the previous version as well, such as resize/merge partitions, clone disk and partition, convert dynamic disk to basic disk, create bootable disk, etc. * Resize dynamic system volumes – extend or shrink system volume on dynamic disk easily. * Upgrade system disk directly – clone system hard disk to a bigger one without reinstalling system and applications. The Company specializes in backup software, partition manager and data recovery for Windows. Its major products are EaseUS® Partition Master, EaseUS Todo Backup, and Data Recovery Wizard. For more information, please visit http://www.easeus.com . 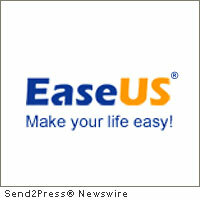 “EaseUS” is a registered trademark of CHENGDU Yiwo® Tech Development Co., Ltd.
– RSS news-feed for EaseUS: https://send2pressnewswire.com/author/easeus-software/feed . Original Keywords: Resize dynamic system volumes, EaseUS Partition Master, convert windows dynamic disk, extend or shrink system volume on dynamic disk easily EaseUS Software New York City New York NEW YORK CITY, N.Y.
REFERENCES: China Business News, Resize dynamic system volumes, EaseUS Partition Master, convert windows dynamic disk, extend or shrink system volume on dynamic disk easily EaseUS Software New York City New York NEW YORK CITY, N.Y.